Machine Learning (ML) is one of the fastest growing fields today. Financial Institutions continue to implement ML solutions to understand how markets work, access data, and forecast trends. In the new Machine Learning and Reinforcement Learning in Finance Specialization from New York University, you’ll learn the algorithms and tools needed to predict financial markets and how to use ML to solve problems. How did you become interested in machine learning and finance? I started in theoretical physics and eventually, that led me to my first job in finance as a quantitative researcher focused on models of option pricing and credit risk modeling. I started using various methods of non-parametric statistics for my models, and then slowly migrated into machine learning methods. I self-educated which is why I wanted to help create this Specialization because I know what it’s like to learn on your own. This course is designed for students of finance or those who already work in finance who want to further their career by growing their skillset. Before taking this Specialization, learners should have a decent understanding of basic math including calculus and linear algebra, basic probability theory and statistics, and some programming skills in Python. People who already know Machine Learning and/or Reinforcement Learning and want to learn about their applications in finance may also benefit from taking this Specialization. Could this Specialization also benefit a data scientist who wants to work in finance? Absolutely. Data scientists use many tools from Machine Learning, they just need to learn about Finance in order to understand how to use them in this domain. 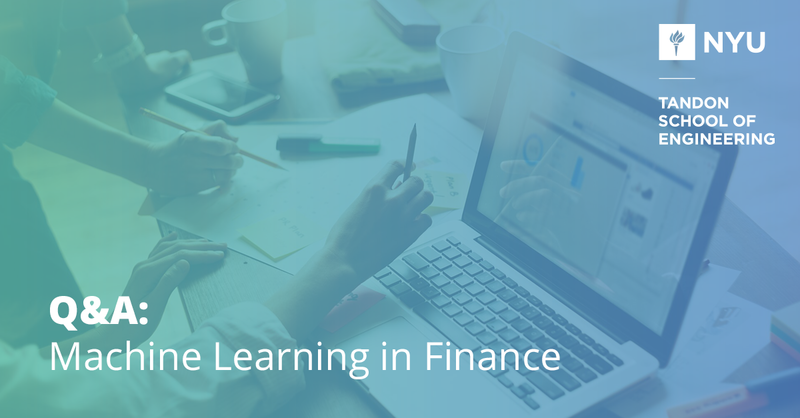 Why is it important for someone working in finance to understand machine learning? Machine Learning gives you more tools in comparison to traditional financial models. When you know both, your abilities quadruple. How would this specialization give learners a leg up in their careers? Machine Learning in finance is booming. This Specialization will help people learn on their own and allow them to use their new skills the next day, on the job. It will help those seeking quantitative roles prepare for the next chapter of their career. Quantitative finance means you’re doing something directly related to machine learning. You’re either using ML as a tool for a specific problem or developing new financial models. Enroll in the Machine Learning and Reinforcement Learning in Finance Specialization from NYU today.